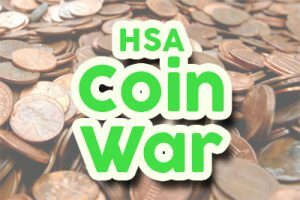 Get Involved in The Coin War! We are doing it a little differently this year. Instead of counting the coins, each homeroom is competing to see which class bucket is the heaviest. Sounds easy, right? Put as many coins (pennies & silver) as you can in your class bucket. The heaviest bucket after 3 days will win! Students from opposing classrooms will be attacking your class by dropping dollar bills or checks into your bucket, lowering your total bucket weight. For each dollar (either bill or check) ½ ounce will be deducted from your class’s total bucket weight. For example – if a bucket is attacked with $10.00, that bucket will decrease by 5 ounces. The top three classes win a popcorn party and bragging rights!! Please make checks out to H.S.A. The checks will deduct ½ ounce per dollar from the bucket’s total weight – the same as bills. Classroom teachers will hold their class buckets outside their rooms so opposing students can attack. K-1 buckets will be outside of the Media Center. The buckets will be weighed every day and the leaders announced each afternoon. Students will have 5 MINUTES to attack other classrooms each morning. Challenge time is from 7:55-8:00 AM. No attacks will be made after the tardy bell.